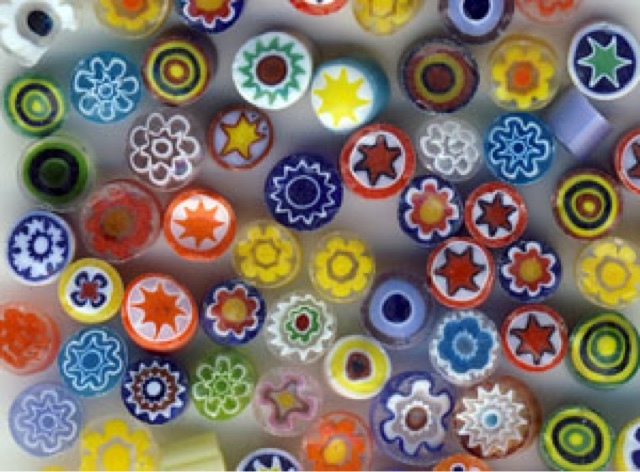 Millefiori translated from Italian to English as "thousand flowers" and it's a glass technique that dates back to Roman times. Examples have been found in the Sutton Hoo burial site so we know that "mosaic beads" as they were called were a hot and highly valued trade item. The island of Murano was home to the technique for hundreds of years but the secret to making the murrini canes died out and was revived in the 1800s. Here is a picture of the millefiori I work with in my enamelling. 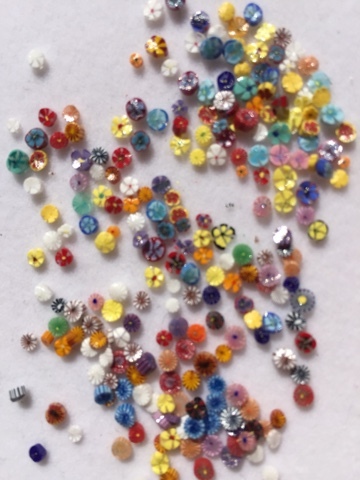 Very tiny and very pretty flower shapes. I must confess mine are likely at least 50 years old as my neighbour gave them to me and they had been tucked in a stash she inherited from an older woman who was a glass artist in the 60s. I've not seen millefiori quite like them anywhere. I then place them into my enamelled designs. When they are heated along with the glass enamels, they spread out into beautiful flower shapes. It's a fun way to create enamelled glass compositions. Here's an example of some finished pieces I created. Local artist Virginia Wilson Toccalino creates beautiful murrini canes and composes them into stunning paperweights. Her work was captured by the How It's Made people and you can watch a short You Tube Video of her creating millefiori paperweights here. 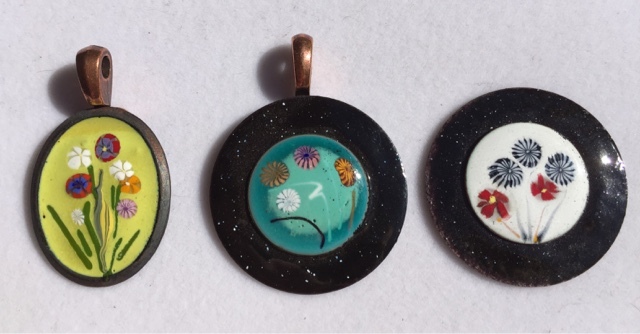 You can get millefiori through Thompson enamels. They cost $9USD for about 100. Of course, the technique was taken up by polymer clay artists. It's a bit easier to work with forgiving clay and roll it out with your hands than it is to work in hot glass and pull canes of glass. But the results can be equally as stunning. So incorporate a little bunch of millefiori into your life and you'll find their petite perfect beauty will make you smile.